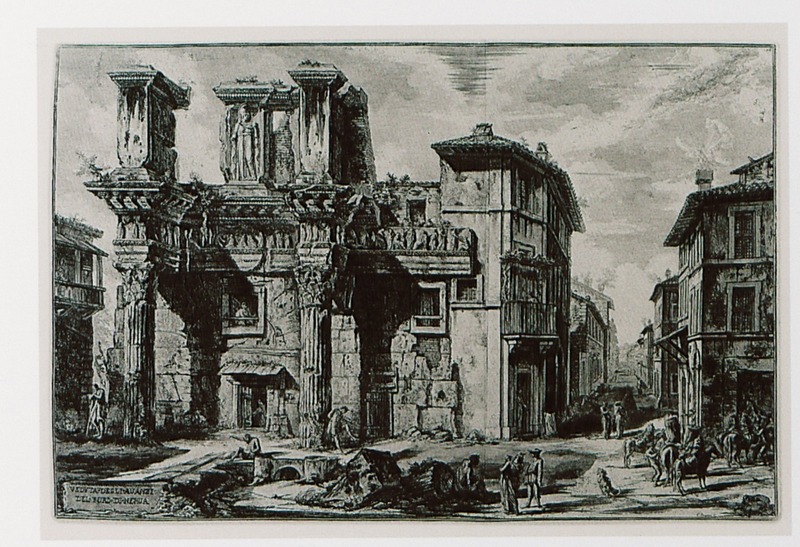 Imaginary depiction of Doric stoa, Rome. 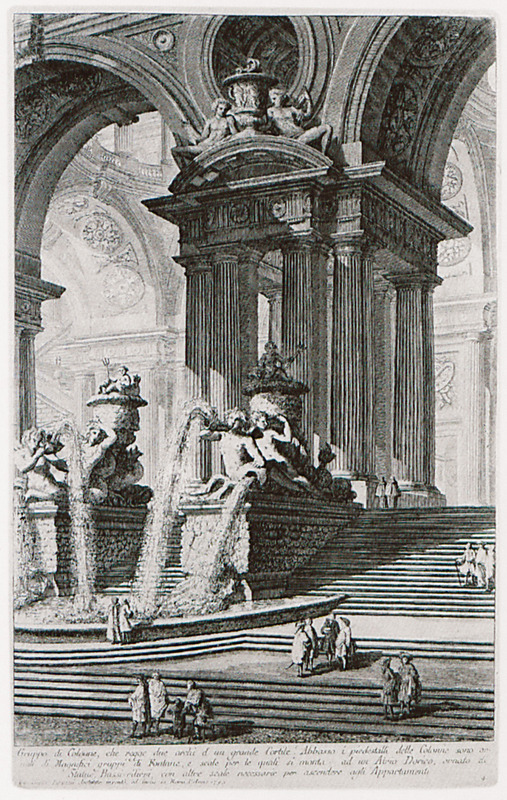 Imaginary depiction of tetrapylon and fountain at Doric portico in Rome. 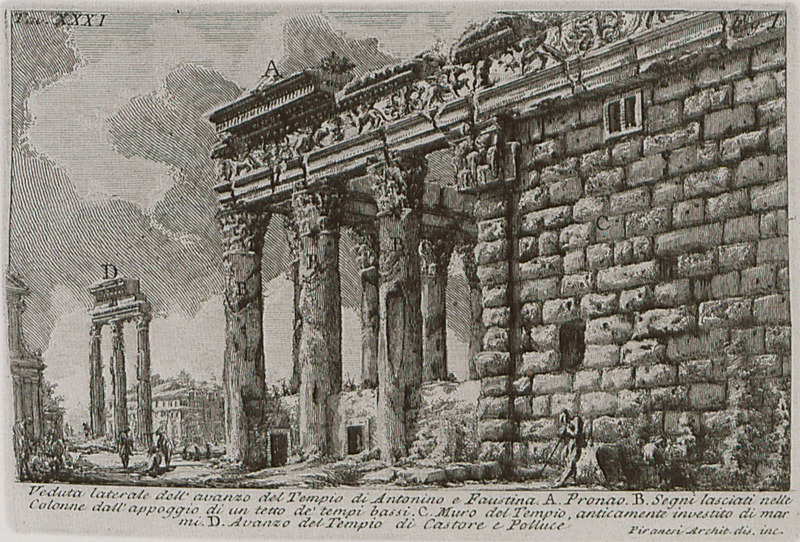 View of the remains of the portico of M. A. Lepidus. 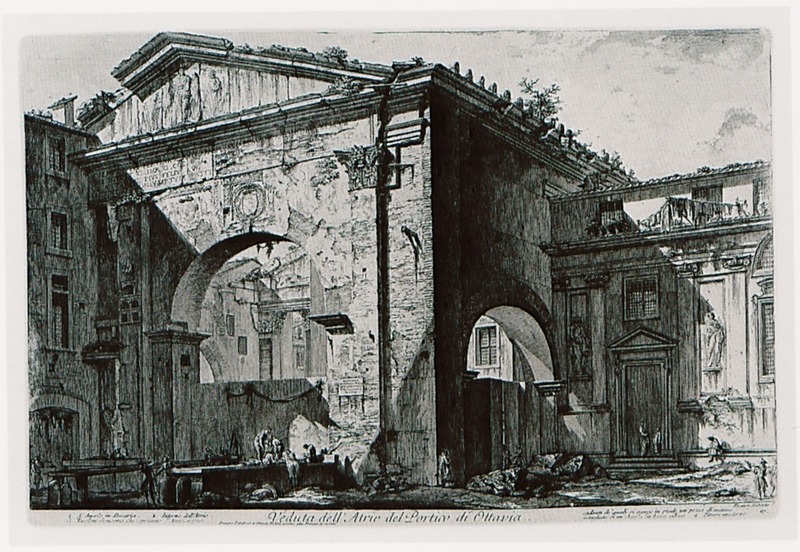 Side view of the church of San Lorenzo in Miianda, built on the site of the temple of Antoninus and Faustina in Rome. 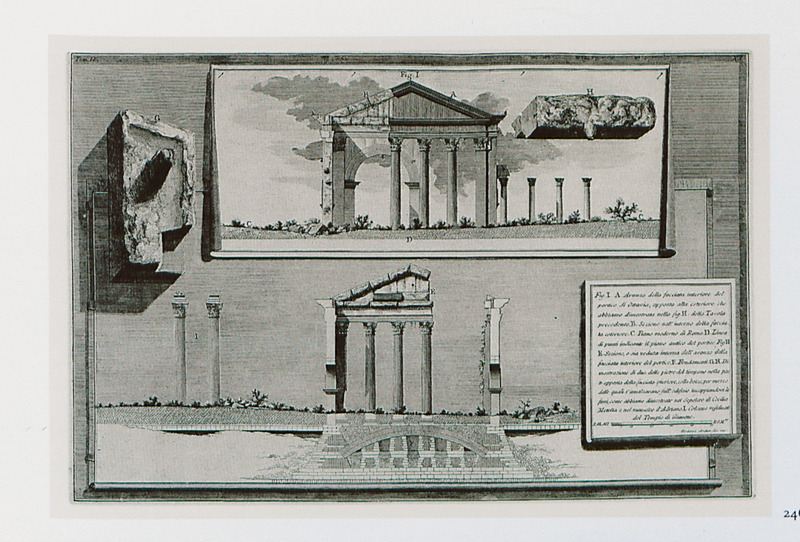 Portico of Octavia, Rome: Elevation, plan and reconstruction of the main entrance. 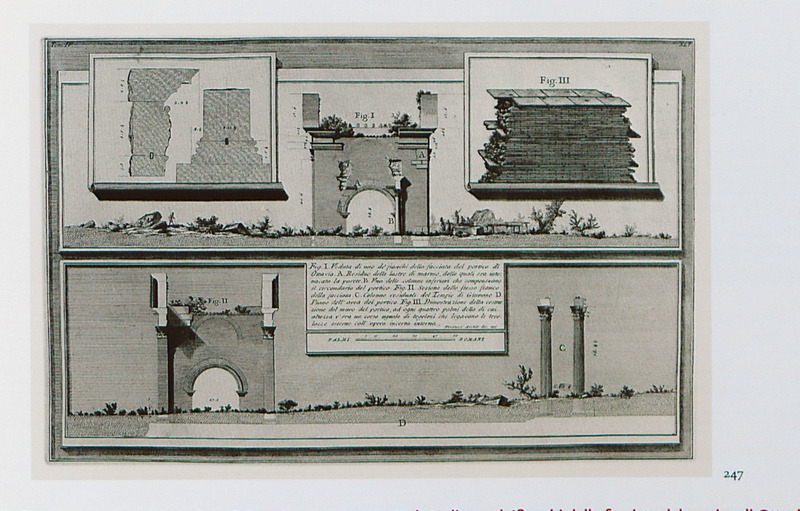 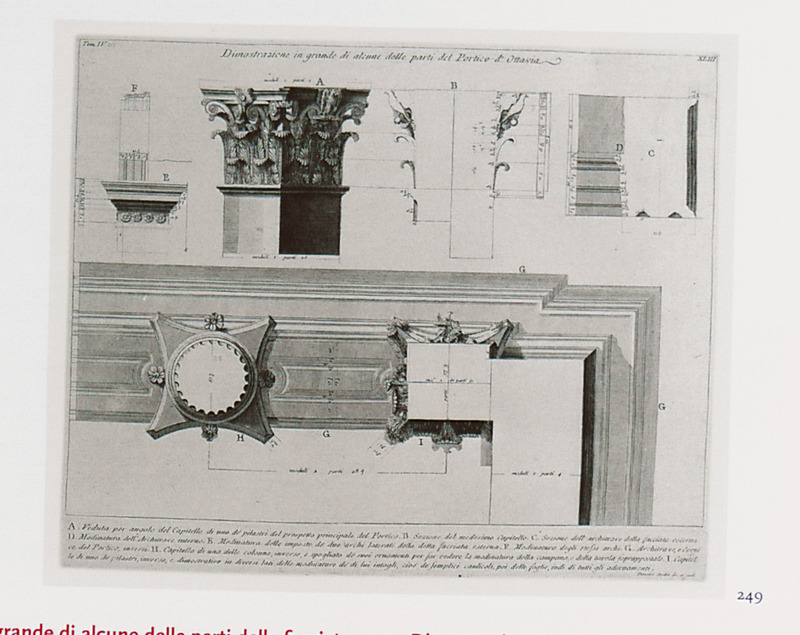 Portico of Octavia, Rome: Elevation, plan and architectural features of the main entrance. 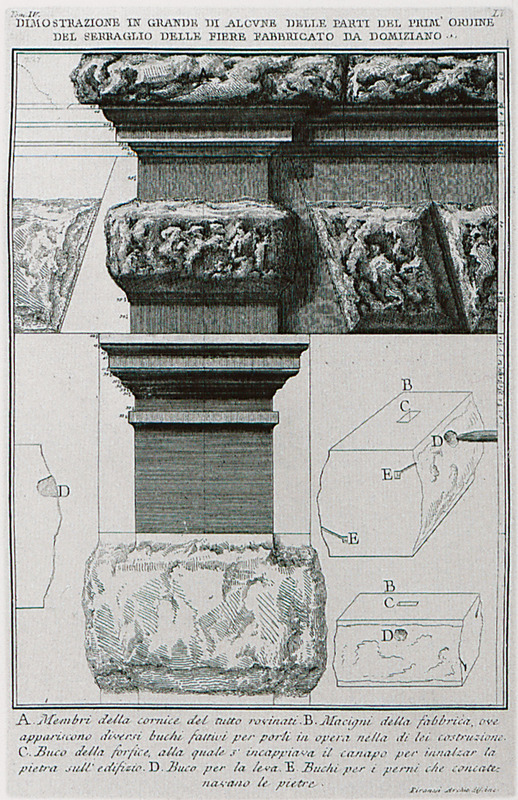 Portico of Octavia, Rome: Section and architectural features of the main entrance. 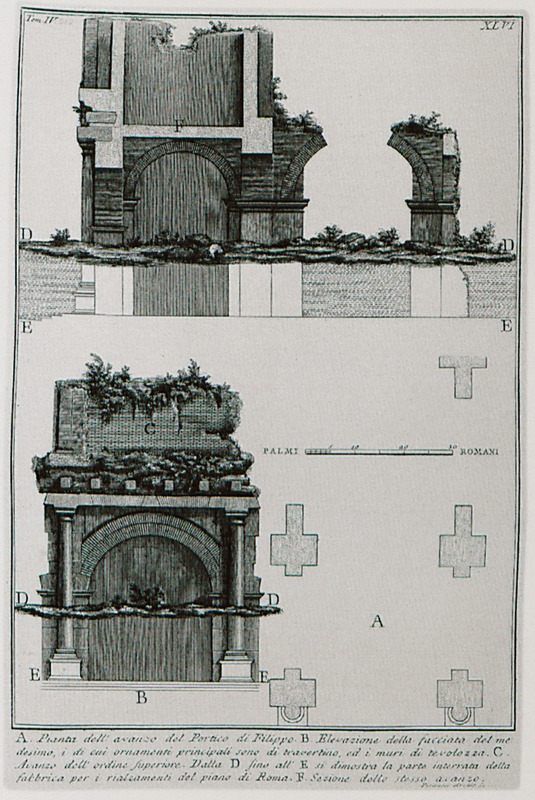 Portico of Octavia, Rome: Architectural features of the main entrance. 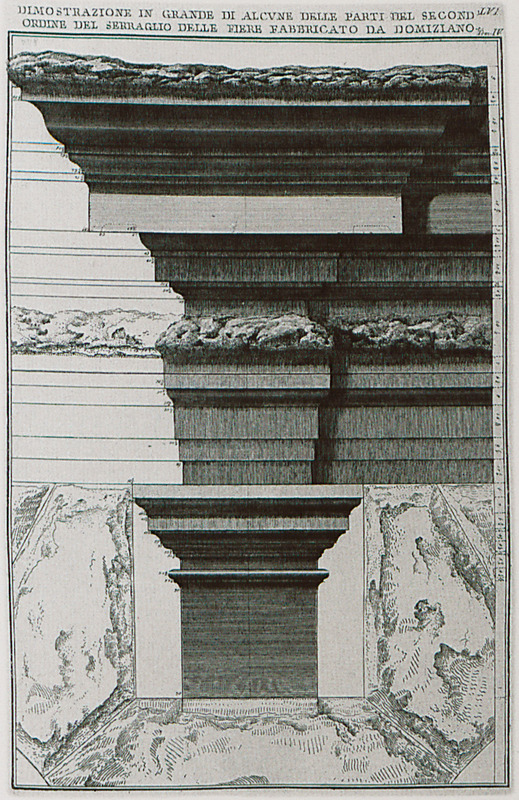 Portico of Octavia, Rome: Architectural features of the main entrance (elevation and celing plan of anta, Ionic column). 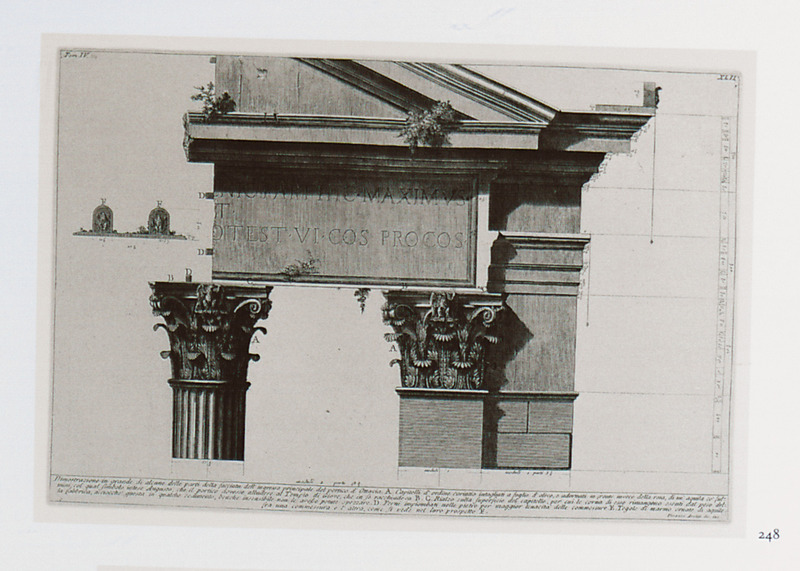 Portico of Octavia, Rome: Architectural features of the main entrance (entablature and Ionic column). 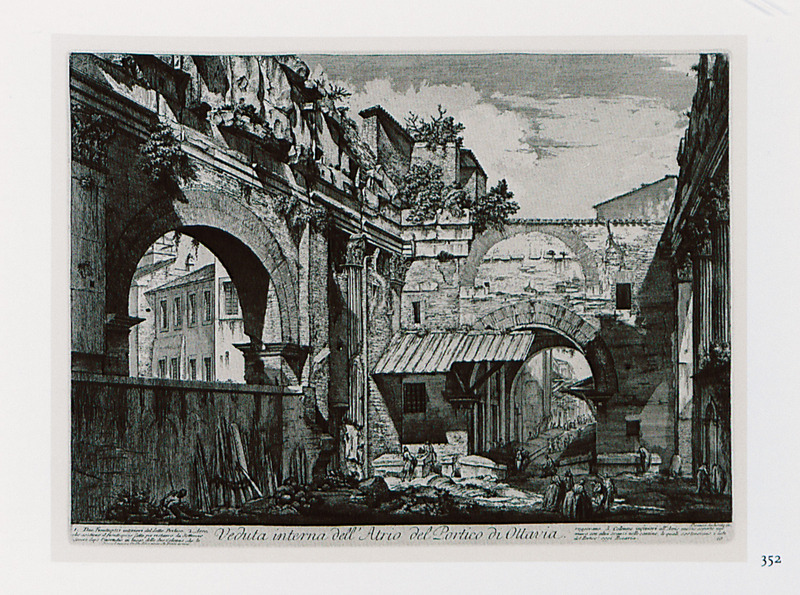 Remains of the Porticus Philippi around the temple of Hercules and the Muses, Rome. 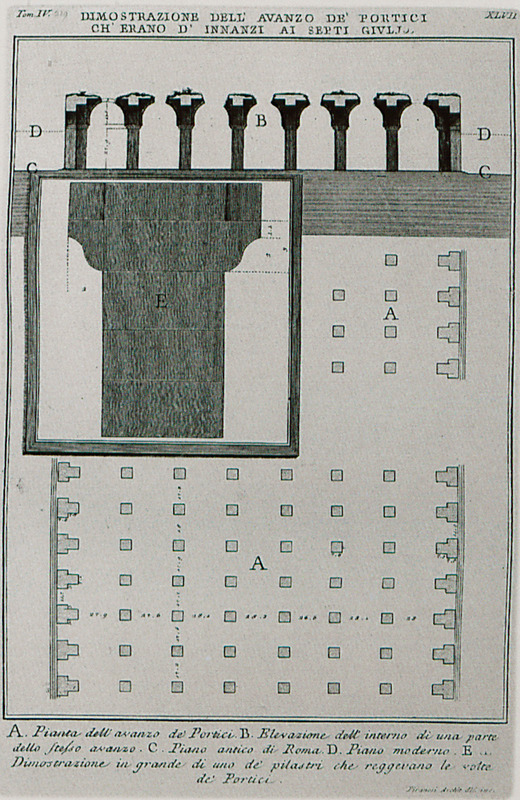 Plan of Saepta Julia and the surrounding portico. 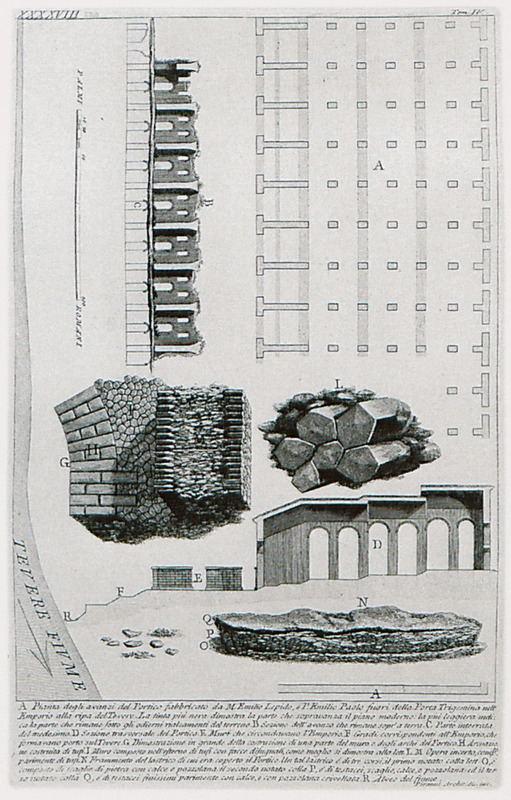 Plan and architectural features of the remains of the Aemilius Portico at the Roman forum of Rome. 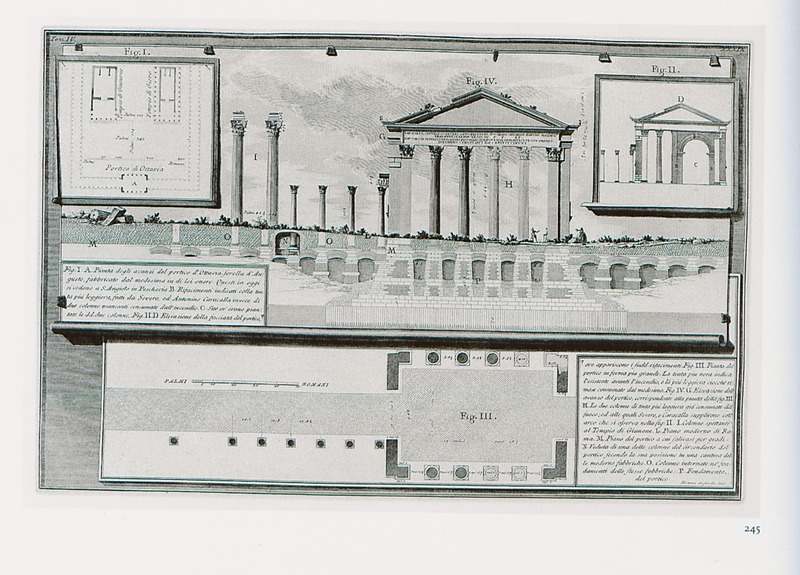 Plan and reconstruction of the temple of Portunus, formerly called temple of Fortuna Virilis, Rome. 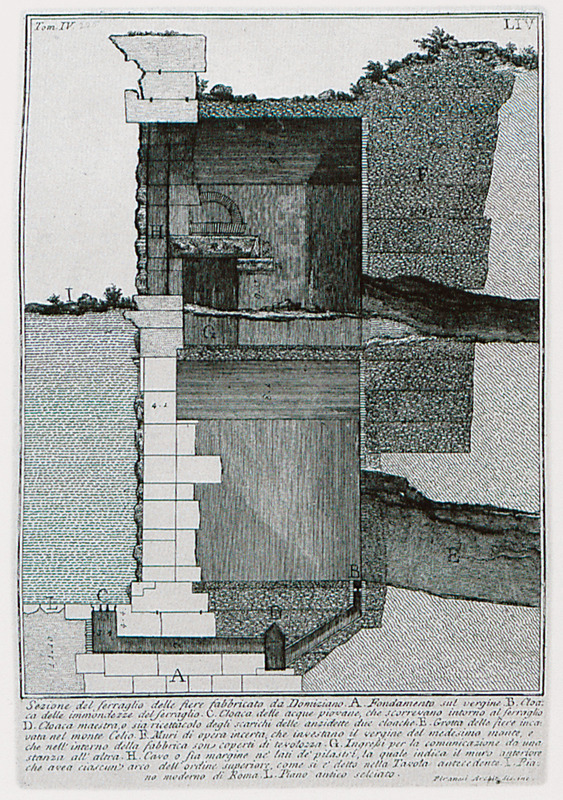 Vertical section of arch at the Divo Claudio temple complex, Rome. 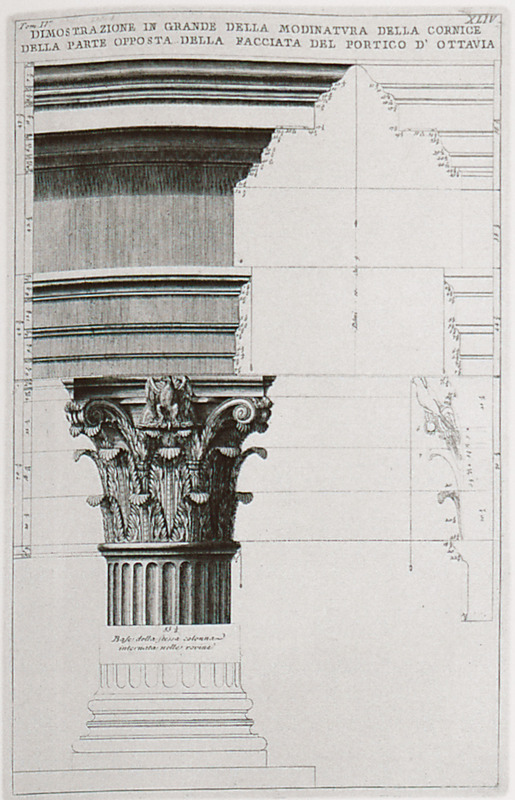 Architectural features of the portico of the Divo Claudio temple complex, Rome. 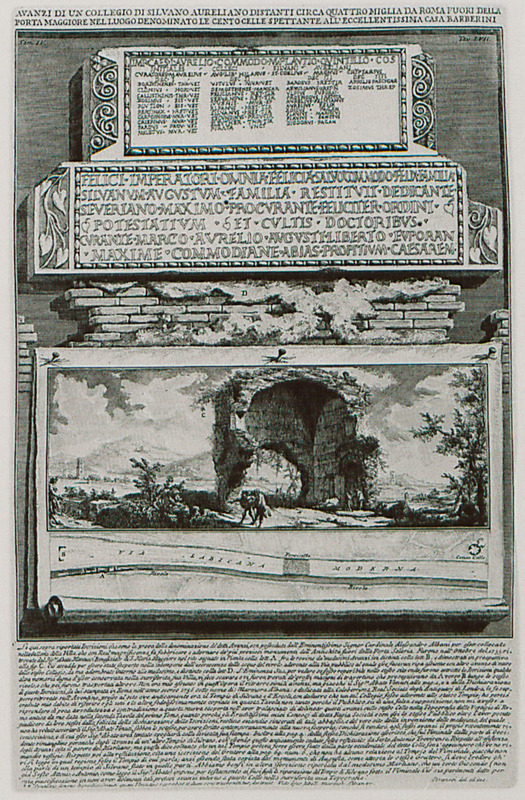 Inscriptions and remains of Roman college near Porta Maggiore, Rome. 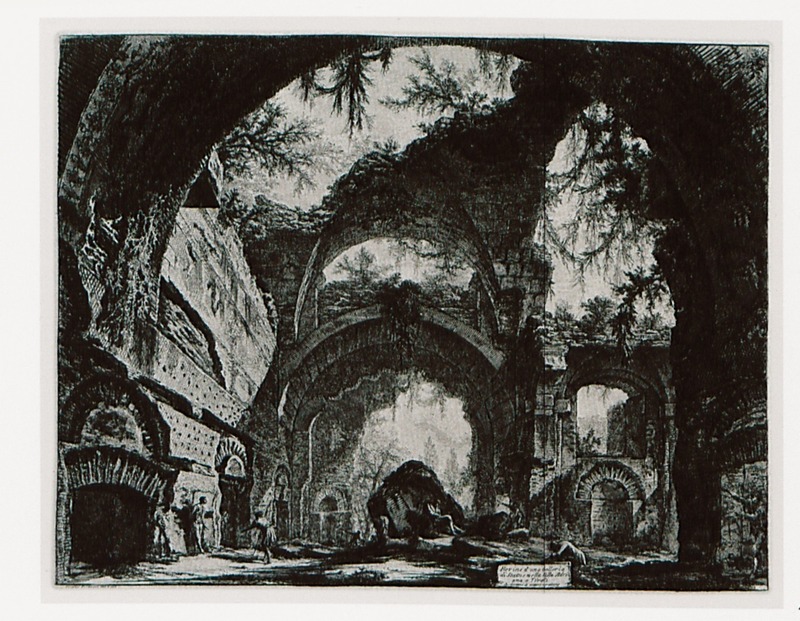 Remains of the dining room at Domus Aurea, Nero's palace in Rome. 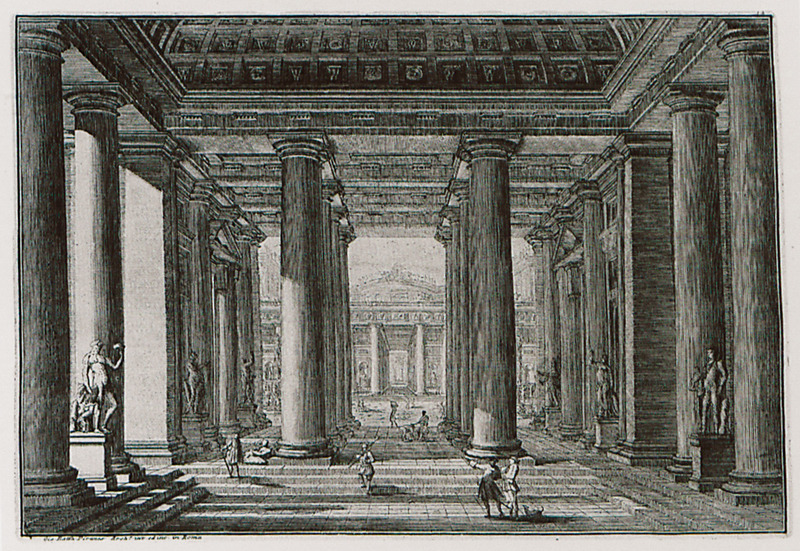 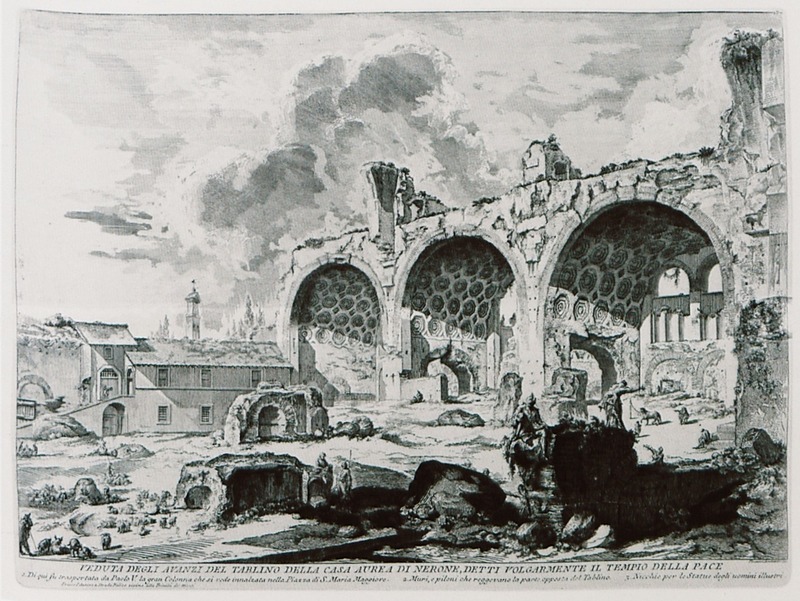 Main entrance to the Portico of Octavia in Rome, in the 18th century. 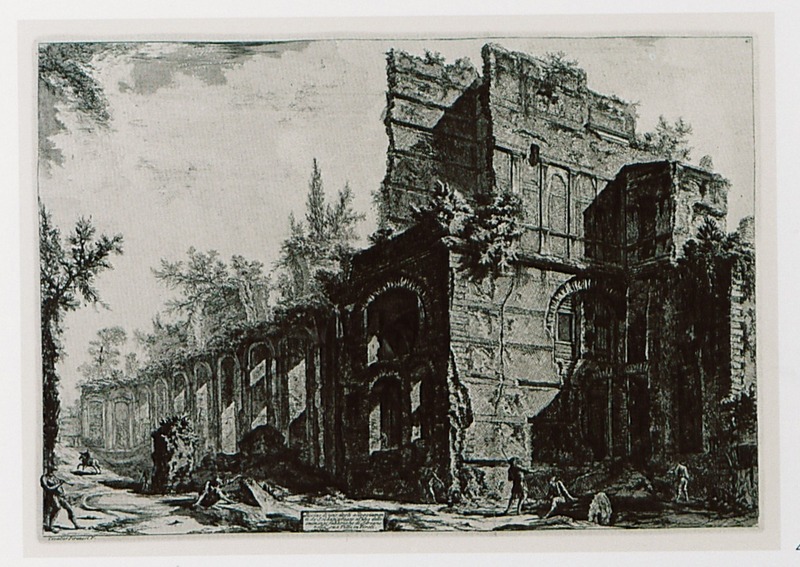 Remains of temple in Rome. 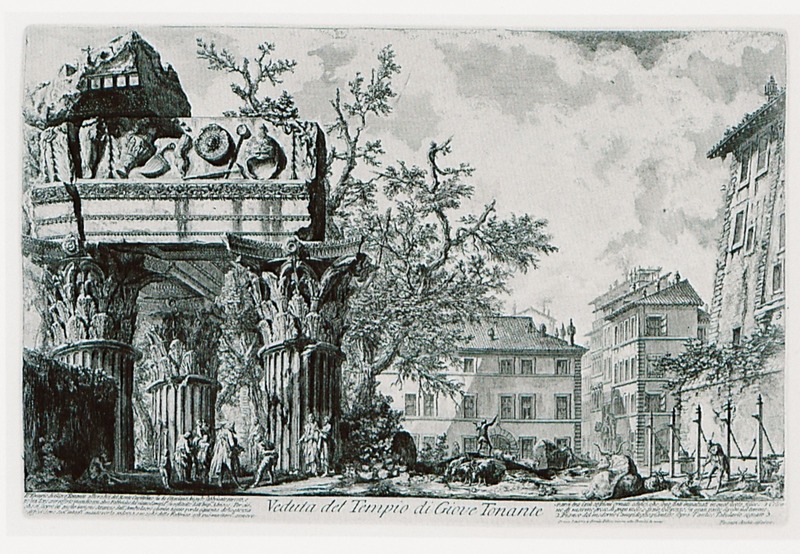 The engraver identifies the site as the temple of Jupiter Tonans. 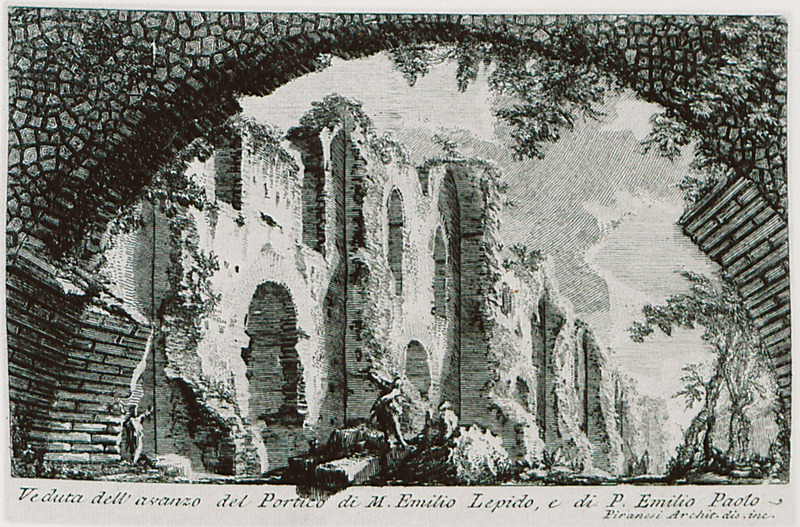 Remains of portico at the palace of Diocletian (today Barberini palace), at the village of Castel Gandolfo near lake Albano. 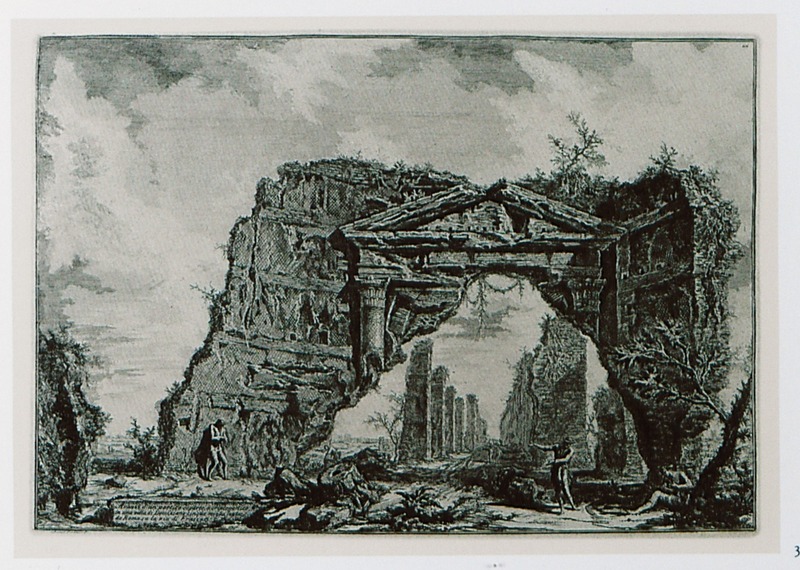 Remains of portico at the Villa of Hadrian at Tivoli. 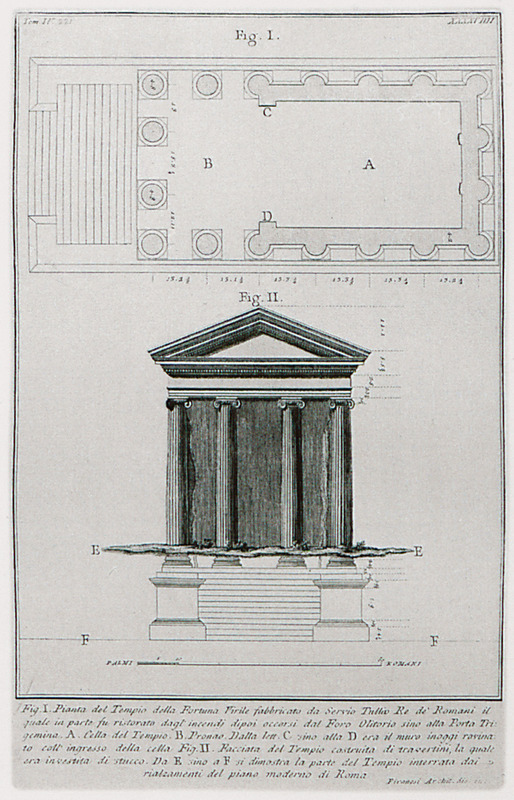 Remains of stoa built according to the model of Poecile Stoa (ancient Agora of Athens), at Hadrian's villa at Tivoli. 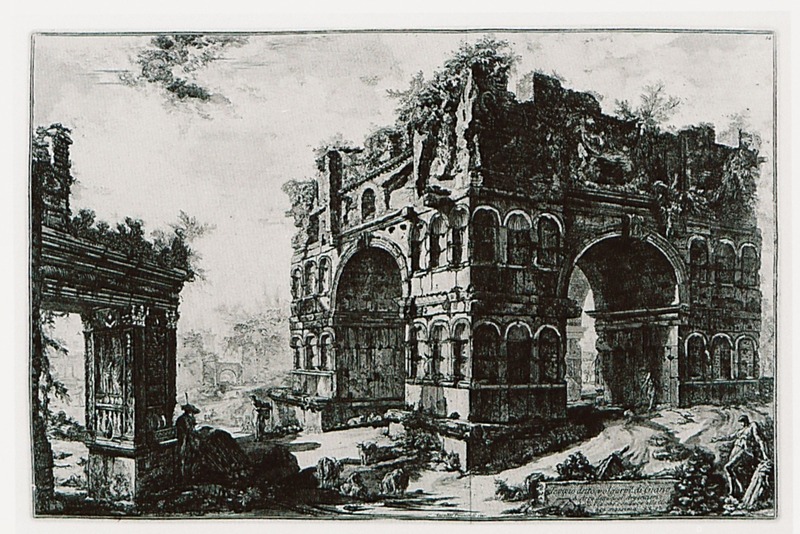 Remains of portico at the Forum of Nerva, Rome. 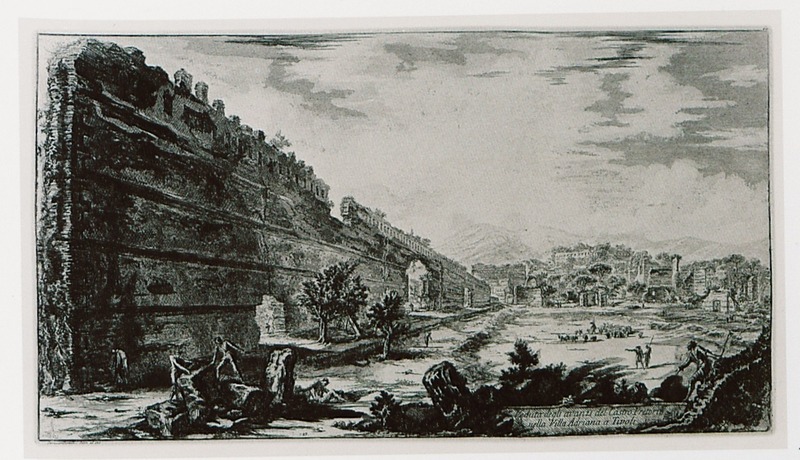 Remains of soldiers' barracks at Hadrian's Villa, Tivoli.